An uncommitted reader of the British press would rapidly conclude that, on the issue of the UK’s continued membership of the European Union, there is an easily-drawn dividing line. Those who favour withdrawal are on the right in political terms; those who would retain membership are on the left. Readers of the centre-left or liberal press would go further; coverage of the issue would suggest that the supporters of Brexit are not only right-wing, but ignorant, prejudiced, xenophobic, or just plain deranged. The possibility that there is a perfectly rational and moderate case for reconsidering our future in Europe, a case that is not only consistent with a left-of-centre stance, but actually required by it, is overlooked. The debate is all the poorer for it. My own involvement with this issue goes back a long way. A s a new recruit to the Foreign Office in 1964, I worked on Common Market issues and later, from our Brussels embassy, I helped to organise the Wilson-Brown tour of Common Market capitals as part of a further attempt to have the Gaullist veto on our membership lifted. By the time I returned to the UK in 1968, I was clear that the issue was not whether we should or could be part of Europe, since no one could doubt that we were historically, geographically, culturally, politically, and inevitably, an integral part of that entity, however defined. The question was not whether, but what kind of Europe? I came to the realisation that what we were offered was not “ Europe” but a Franco-German deal guaranteeing free trade in manufactures to the Germans in return for subsidised agriculture to suit the French. Joining “Europe” in 1972 represented for Britain a restriction of our trading opportunities and an abandonment of a rational and long-established trading pattern. It meant, through the Common Agricultural Policy, to whose costs Britain was and remains a major contributor, a substantial increase in food prices and therefore in domestic costs, making British manufactured goods more expensive. It also meant an end to preferential markets beyond Europe, and opened us up instead to direct competition from more efficient manufacturing rivals in a single European marketplace. But have we not derived great advantage from our trade with the EU? Well, hardly. Let us put to one side the very large annual contribution we pay to the EU (a continuing burden, as it happens, on our balance of payments). We have now run a trade deficit every year since 1982, which was just as the full impact of EU membership took effect – not just a coincidence, since the greater part of that deficit is with the other members of the EU, and much of it arises in the trade in manufactured goods. The result is that our manufacturing sector has shrivelled away, and our net investment in new manufacturing capacity is virtually nil. W e are of course solemnly warned that our EU partners will refuse to trade with us if we insist on a different and better Europe; but are they really going to turn their backs on a one-sided trade relationship that has been so much to their advantage? The weakness of the case for continuing membership of the current arrangement is shown by the fact that it is almost always articulated in terms of rival pessimisms; we are constantly told that the burdens of membership are outweighed by the risks of being left out in the cold. But we should take courage from the lessons of experience. Similar arguments led us to join the European Monetary System, which proved disastrous, and were then repeated in respect of the euro. Most people in Britain will offer daily thanks that we had the courage to reject those arguments and to stay out of the euro, and there is no reason to suppose that they have any greater weight in the current debate. Our trading partners in Europe need us at least as much as we are said to need them, as post-Brexit negotiations would surely demonstrate. In any case, a decision in favour of Brexit would not mean, as is so often alleged, turning our backs on Europe. It would signal instead the opening of a new agenda, aimed at developing a better and more constructive Europe, and one with a greater chance of success. A new Europe would not operate, as it has done since its inception, as a manifestation of free-market capitalism, serving the interests of big business rather than those of ordinary people. It would not impose a policy of austerity in thrall to neo-classical economic doctrine. It would not run a hugely diverse economy in terms of a monetary policy that suits Germany but no one else. It would not impose a political structure decided by a small elite, but would allow the pace of cooperation and eventually integration to be decided by the people of Europe as they and we became more comfortable with the concept of a European identity. BREXIT voters made a “stupid decision” and it is still “legally” possible for the UK to reverse the withdrawal from the Brussels bloc, a top EU official claimed. Martin Selmayr, chief of staff to EU Commission President Jean Claude Juncker, announced in a conference yesterday the democratic decision to leave the EU could be stopped. The German lawyer added that it would be “arrogant of us” to say the EU could force a reversal to happen. The comments come after the EU's chief negotiator Michel Barnier said he needed to "teach" Britons what leaving the EU means, as voters didn't know what leaving the single market meant. He later backtracked to say he meant Brexit was an "occasion to explain single market benefits in all countries". European Commission chief Jean-Claude Juncker delivered his annual state of the union address on Wednesday, in which he laid out his grand vision for federalist Europe, and urged European Union governments to use economic recovery (i.e., Mario Draghi's nationalization of the bond market), the political weakness in the US and Brexit as "springboards" toward a closer union, built on an expanded euro zone and a pivotal role in world trade. The allegedly unintoxicated Juncker sketched out a vision of a post-2019 EU where 30 countries would be using the euro, with an EU finance minister running key budgets to help states in trouble. Among the key proposals put forward by the EU Commission president were compulsory Euro membership for the remaining eight European states outside the bloc, for new countries to join the Schengen zone, plans for closer defensive cooperation leading to the creation of a European army in the next decade and easier ratification of EU-wide trade treaties with foreign powers. Tax and welfare standards would converge and Europe, not the United States, would be the hub of a free-trading world. In short, a blueprint for a United States of Europe. Let's throw off the bowlines. Sail away from the harbour. Catch the trade winds in our sails. “The wind is back in Europe’s sails,” Junker told the European Parliament quoted by Reuters, citing economic growth and the easing of a succession of crises -- Greek debt, refugee inflows, the rise of eurokcepticism reflected in Brexit - that seemed to threaten the EU’s survival. Juncker has also resurrected the idea of merging his own post with that of the President of the European Council, who currently represents the interests of its member state governments, saying it would be easier if “one captain was steering the ship.” Such as president would be chosen in an EU-wide vote. A powerful new EU-wide economy minister has also been touted, one which would have power to whip dissenters in line with a common EU vision. In his best infomercial salesman immitation, Juncker urged Europeans to hurry, or else the generous offer may not last: “Now we have a window of opportunity, but it will not stay open for ever,” he said, emphasizing a need to move on from and even profit from the British vote to leave the bloc in 2019 according to Reuters. Some promptly backed Juncker's blueprint: German Finance Minister Wolfgang Schaeuble said that Juncker’s plan to build a closer European Union based on an expanded euro zone was largely in line with Germany’s vision for the bloc. The German also said that Juncker had discussed with Chancellor Angela Merkel his annual State of the EU speech in which he spoke of a vision of a post-2019 EU where some 30 countries would be using the euro. “It is good that he is putting pressure (to expand the euro zone) but the preconditions (for joining the euro zone) must be fulfilled,” Schaeuble told the ARD broadcaster in an interview. “It is in fact so that EU countries who fulfill the preconditions become members of the euro under the Lisbon Treaty”. However, the German who in the summer of 2015 nearly kicked Greece out of the Eurozone, added that EU countries wishing to adopt the single currency should not do so before their public finances and economies are sound enough as they could face the fate of Greece, which had to be bailed out by the EU and IMF in 2010. Desperate to put the Brexit humiliation in the rearview mirror, Juncker said that “we will keep moving on because Brexit isn’t everything, it is not the future of Europe," Brexit supporters promptly said his speech showed they were right to take Britain out of a bloc set on creating more powerful, central institutions. The most predictable opponent of the hour-long speech, met with stirring applause by a mostly zombified audience, was UK MEP Nigel Farage. "The message is very clear: Brexit has happened, new steam ahead… More Europe in every single direction and all to be done without the consent of the people,” Farage told the floor. “The way you’re treating Hungary and Poland already must remind them of living under the Soviet communists. All I can say is thank God we’re leaving because you’ve learned nothing from Brexit. It wasn't just the Farage: Juncker's core proposal for countering what is known as a “multispeed Europe” by encouraging all states to join the euro and other EU structures was met resistance in both non-euro zone countries and potentially in Paris and Berlin, where the newly elected President Emmanuel Macron and about-to-be-re-elected Chancellor Angela Merkel are readying their own plans. Poland’s Eurosceptic ruling PiS party, which is embroiled in a bitter legal fight suggested the plan is optimistic in view of the ongoing crisis with migration, unemployment, stagnation and terrorism. “We need to get the EU’s house in order before there can even be a discussion on centralizing even further,” said Ryszard Legutko, a PiS MEP. Opposition also came from members of the European parliament’s left-wing coalitions. “When I listen to [Juncker’s speech] with the ears of many people who feel left behind by the current macroeconomic policies that we have, then I have my doubts because he still pushes for free trade deals that basically are tailor-made for multinationals,” Philippe Lamberts, of the Greens-European Free Alliance group told the Daily Express. However, the most focused and principled attack on Juncker’s plans came from Harald Vilimsky, of Austria’s Freedom Party, which prompted Juncker to leave mid-speech, and once again demonstrated the deep splinters within the core of the Union, splinters which make the integration Juncker is seeking impossible. “What Mr Junker wants de facto is to force the European union into a single state, and we know that the euro is not a success story. The second thing Mr Junker wants is de facto to actually get rid of all the internal borders, we see 10,000, 100,000, millions of African and Arabs are going to be coming to our continent,” said Vilimsky, who serves as the vice-chair of the Europe of Nations and Freedom party within the European Parliament. Danish Prime Minister Lars Lokke Rasmussen said he was against creating an EU-super-president, tweeting “Let’s not mix roles and competences. Need European Council President as voice of member states." Meanwhile, Germany and France, the two foundational powers in the union, are preparing to submit their own plans for EU reform by the end of 2017, and while their current leaders remain in favor of the EU, it is unlikely that either will endorse Juncker’s federalism without a mandate from their respective electorates. In short, Juncker's speech like virtually everything else out of Brussels in recent years, was just more hot air. BREXIT could boost the economy by £65billion a year through tax cuts and spending increases, according to a new report. Quitting the EU will reinvigorate the British economy, creating a flood of extra revenue for the Exchequer that could cut taxes, boost public spending and slash the national debt. The Budget for Brexit report was prepared by a 16-strong group of Eurosceptic economists, Economists for Free Trade. It comes as the Office for Budget Responsibility reveals that the UK tax burden, at over a third of national income, is about to hit its highest level for nearly 50 years, when Labour’s Harold Wilson was in power in 1970. Assuming Brexit occurs in the third quarter of 2020, the Economists for Free Trade group predicts that growth will improve as costs and unemployment fall, real wages will rise and higher output will drive down the exchange rate as new markets are sought by exporters. The 37-page report rejects gloomy economic forecasts from the Treasury and Office for Budget Responsibility. It says: “It is certain that the OBR will not make the positive assessment of Brexit that we have made. The promise of a big boost to the economy over the next decade is based on a new economic forecast which factors in a fall in prices because of the scrapping of EU tariffs on goods from the rest of the world, improved export performance and an end to the annual EU subscription of £10billion. The economists predict this will push growth up to nearly three per cent a year by the mid-2020s. Over the first half of the 2020s, state borrowing and the national debt will fall. The budget surplus is expected to reach £40billion a year by 2025, rising to around £90billion by the end of the decade. The report forecasts that the Chancellor could prudently give away an extra £25billion a year over 2020-2025 in lower taxes and/or higher spending and still pay off debt. From 2025 onwards he would have an extra £40billion to play with, making a total of about £65billion a year. The research has been led by Margaret Thatcher’s former adviser, Professor Patrick Minford. To illustrate the scale of the potential tax cut dividend from Brexit, the report says it would cost just £12billion by 2025 to reduce corporation tax by two per cent, the higher rate of income tax by two per cent and the additional rate by seven per cent. This would leave another £13billion which could be spent, for instance, on the NHS. With an extra £40billion of revenue resulting from fast post-Brexit growth after 2025, the report calculates that corporation tax could be cut by a further three per cent, the higher rate of tax by another two per cent and the standard rate by two per cent. This would cost around £20billion leaving a further £20billion to raise public spending while keeping debt at a prudent level of below 60 per cent of national output. Professor Minford said: “When Britain leaves the EU it is essential the right policies are in place to ensure our economy thrives and seizes the economic opportunities of Brexit. “The Chancellor and the Treasury play a central role in this and must show ambition and leadership. Regrettably, since before the referendum the Treasury and the OBR have been consistently negative about a post-Brexit economy. The Chancellor must use this Budget to set out a positive vision of a Britain thriving outside the EU. “We have set out a Budget for Brexit that would provide huge tax cuts for hard-working people and cuts to corporation tax while at the same time reducing the debt to GDP ratio and enabling spending rises. DISCUSSIONS are underway to create an EU Olympic team as part of the bloc’s push for an ever closer Europe, it is claimed. West Midlands MEP Bill Etheridge said the suggestion of a team comprising EU members was the subject of "serious" debate behind closed doors in Brussels and Strasbourg. The UKIP MEP said Brussels chiefs would like like an EU team enter the 2036 Games, the 100th anniversary of the Berlin tournament, which was opened by Adolf Hitler. And he claimed it was partly driven by envy of Great Britain’s success in Rio and London. He said: “There have been quite a lot of conversations about it among other MEPs and it was being taken quite seriously by some of them. "They were using the word solidarity, which tends to be code for ever closer union. “It speaks to their plan to create a united states of Europe. "I'm almost certain there was some jealousy at Britain's success in 2012 and 2016 and they want a piece of our success. The secret discussions have only been held informally so far and no official approach has been made to tournament organisers, The Telegraph reported. Team GB finished the 2016 Rio Games second in the medal table behind the US, having won 27 golds. Germany came fifth with 17, France seventh with 10 and Italy ninth with eight golds. British success followed the 2012 Games where 29 gold medals were won on home soil, the highest of any European nation. News of trying to bring the bloc’s members together for the world’s biggest sporting event comes at the end of a year where key Brussels figures have launched plans for a much tighter union. European Commission President Jean Claude-Juncker and French leader Emmanuel Macron have led the charge, with proposals for a joint budget and EU army. In a landmark speech in September, Mr Juncker set out a vision for a united states of Europe. He said he wanted more financial unity across the bloc, headed by a new finance ministry while transforming the eurozone’s bailout powers into a European Monetary Fund. 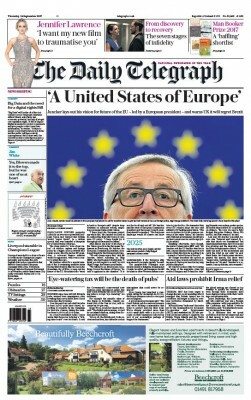 Mr Juncker also wants every member state to join the Euro. Brexiteers pointed to the speech as a demonstration of why the UK was right to leave the bloc. Among high-profile critics of the approach was ex-UKIP leader Nigel Farage who raged: "I think Europe is about diverse nations and cultures. “It makes it the most fascinating continent on Earth and provided that all democratically run, they will be at peace. "I've seen time and again the peoples of Europe in referendums reject deeper integration, reject the European constitution just to be wilfully ignored by Brussels who have either made them vote again or ignored them and gone round the back of them." A clear majority of Scots want the country to stay part of a post-Brexit UK rather than becoming independent and remaining part of the EU, an opinion poll has found. The results of the survey, carried out a month after the result of the European referendum, calls into question Scotland’s appetite for a re-run of 2014’s vote on independence. “The arguments for Scotland remaining a part of the UK are just as compelling as they were in 2014 – in or out of the EU” Lord Dunlop The YouGov poll found that 46 per cent of Scots would prefer to remain part of a post-Brexit UK, while only 37 per cent favoured of breaking up the Union and being allowed to remain in the EU. The results will be seen as a blow to the SNP’s hopes of securing independence for Scotland following the UK’s decision to leave the EU last month, which came despite 62 per cent of Scots voting to remain. IndyRef2? Nicola Sturgeon, the SNP leader, warned in the aftermath of the result that a second referendum on Scottish independence was now “highly likely” as voters would be furious at the prospect of being dragged out of the EU against their will. The survey also found that the result of the EU vote has not had much of an impact on people’s opinions on independence, with a majority of people continuing to favour remaining part of the UK. Only 47 per cent said they want Scotland to become an independent country, while 53 per cent want to keep the Union intact, the poll of more than 1,000 Scottish adults found. The survey also showed that more Scots would rather be part of a post-Brexit UK with no access to the EU’s single market than leave the Union to secure continued free trade, with 40 per cent favouring the former scenario and only 34 per cent the latter. “Inevitably, some will suggest that the high-water mark of Scottish independence has now passed, especially as it was thought that leaving the EU might persuade No voters to change their minds and vote against the Union,” said Joe Twyman, YouGov’s head of political and social research. “However, the situation is, naturally, more complicated than that. There remains a great deal of uncertainty about what the UK’s relationship with the EU will look like…once precise details of Brexit are hammered out it could change the whole context of the independence debate.” ‘Divisive constitutional debate’ The Scottish Conservatives said the poll’s findings “completely exposes the SNP’s post-Brexit hyperbole” and called on Ms Sturgeon’s party to “get back to the day job, instead of agitating for yet another independence drive”. Scotland Office Minister Lord Dunlop added that another “divisive constitutional debate” was not want the country wanted. “The arguments for Scotland remaining a part of the UK are just as compelling as they were in 2014 – in or out of the EU,” he said. “The Prime Minister has been very clear that we are going to make a success of Brexit, and the focus now needs to be on collaborative working with the Scottish Government as ‘Team UK’ to ensure the best possible deal for Scotland and the rest of the UK.” However, the SNP pointed out that support for independence had risen since YouGov’s last poll on the subject, suggesting that No voters were reconsidering their views in light of the UK’s decision to leave the EU. “In light of the overwhelming vote to remain in the EU, it is right that the Scottish Government explores every option to protect our relationship with and place in the EU – including the option of another independence referendum if that is what it takes,” said SNP business convener Derek Mackay. COUNTRIES should be forced to sign up to a “United States of Europe” by 2025 or else be booted out of the EU with immediate effect, a top German politician demanded today. Martin Schulz, who hopes to enter a coalition with Angela Merkel and become Berlin’s second most powerful figure, said any member states who refuse to join his new superstate must leave. He called for a new treaty to formally convert the EU into the United States of Europe, along the lines of the United States, though bizarrely claimed this was “no threat” to individual countries. The socialist leader, who humiliatingly led his party to its worst ever showing in September’s general election, is now attempting to stitch together a coalition deal with Mrs Merkel. Mr Schulz a bombastic former MEP and EU Parliament president who quit his Brussels job to take on the German chancellor, has never hidden his federalist ambitions. His proposals would create federal Europe, which can act together in policy in areas including domestic and foreign security, tax and monetary affairs and asylum and international development. In a conference speech he warned European values were being systematically undermined in countries like Poland and Hungary and that the EU needed more powers to uphold its laws. Afterwards he tweeted in English: “I want a new constitutional treaty to establish the United States of Europe. A Europe that is no threat to its member states, but a beneficial addition. In reality his plan would certainly be vetoed by the other states, who have to agree unanimously on any treaty change, and would be extremely unlikely to get past Mrs Merkel herself. Commentators said that his desire for a United States of Europe is not even that popular within his own party, which is heavily europhile, and stands virtually zero chance of success. Nonetheless, the remarks will heighten the fears of eurosceptics who suspect the EU is heading towards an ever more federalist model in light of Jean-Claude Juncker’s deeply integrationist State of the Union speech. Yesterday the Commission unveiled new plans for a beefed up eurozone, with its own finance minister, whilst plans for an EU army are also rapidly progressing towards reality. Warnings about the possibility of an EU superstate featured prominently in the referendum campaign, with David Cameron securing Britain a special opt-out from ‘ever-closer union’. EU leaders have seized upon the opportunity of Brexit to push forward with ambitious integration plans in a number of areas amid widespread dissatisfaction about how the project is run. Hi All, has anyone read or come across a book, All Honourable Men, by James S Martin? BERLIN (Reuters) - The U.S government has told EU states that it and other non-EU NATO allies should play a key role in a European defence pact, diplomatic sources said on Tuesday. The message, sent to defence and foreign ministries, was meant to underscore Washington’s worries that the pact could duplicate NATO efforts and possibly shut out U.S. arms makers from future European defence contracts, the sources told Reuters. Twenty-five EU governments launched the agreement in December to fund, develop and deploy armed forces together, ending the squandering of billions of euros by splintered defence policies and reducing Europe’s heavy reliance on Washington. The message, sent in a diplomatic cable earlier this month, said Washington supported the plan, but expected the “robust involvement” of NATO and particularly non-EU members of the trans-Atlantic defence alliance, the sources said. “The two main concerns are that there’s no duplication with NATO and that non-EU allies are not cut out of competitions for future weapons,” one of the sources told Reuters on Tuesday. “If the EU countries are joining forces to make acquisitions that are ultimately going to be used in the NATO context, there should be fair and open competitions,” the source added. France and Germany have already announced plans to develop a next-generation European fighter jet and Germany is leading an effort to develop a new European drone. One European official said the U.S. concern about being shut out was “a bit ironic,” given U.S. President Donald Trump’s “America First” policy, and the problems that European firms have historically had breaking into the U.S. weapons market. The U.S. message echoed remarks made by NATO Secretary General Jens Stoltenberg at the Munich Security Conference earlier this month in which he highlighted the importance of non-EU allies in paying for European defences. Once Britain leaves the EU, he said, 80 percent of NATO defence spending will come from non-EU allies. The sources said Washington also told EU states in a separate cable that it planned to boost funding for increased U.S. military exercises and training in Europe by $1.7 billion to $6.5 billion in the fiscal 2019 year beginning on Oct. 1. The initiative, initially known as the European Reassurance Initiative, was launched in 2014 by then U.S. President Barack Obama in the wake of Russia’s annexation of Ukraine’s Crimea region. It has since been renamed the European Deterrence Initiative, or EDI. Trump has been pressing European countries to increase their defence spending and honour agreements to move towards spending 2 percent of economic output on the military by 2024. NATO expects eight of NATO’s 29 members to meet the target in 2018, growing to at least 15 in 2024. US-Hungarian Billionaire philanthropist George Soros faces new accusations of interfering in British politics after announcing he’s supporting a bid to push for a second Brexit referendum within a year. Speaking during a summit organized by the European Council of Foreign Relations think tank, the US-Hungarian financier said that the EU is facing an “existential crisis,” but that Britons should nonetheless be given the chance to vote again on any final Brexit deal and whether to stay in the EU on current terms. Soros has been heavily criticized over his donations of over £800,000 ($1,062,000) to pro-EU campaigns. The pledges included £400,000 to Best for Britain, a campaign group founded by Gina Miller, who successfully defeated the government over its triggering of Article 50 – the letter officially kicking off the Brexit process – without parliamentary consent. “Most of the damage is felt right now when the European Union is in an existential crisis, but its attention is diverted to negotiating a separation agreement with Britain. That’s a lose-lose proposition but it could be converted into a win-win situation,” Soros said. “Ultimately it’s up to the British people to decide what they want to do. It would be better, however, if they came to a decision sooner rather than later. That’s the goal of an initiative called the ‘Best for Britain,’ which I support. Best for Britain fought for, and helped to win, a meaningful parliamentary vote which includes the option of not leaving at all. The billionaire has already come under intense scrutiny after former UKIP leader Nigel Farage warned MEPs in Brussels over Soros’ “truly extraordinary” influence on Brexit. The comments were made after it emerged Soros injected $18 billion (£12.97 billion) into the Open Society fund. Last week in the House of Commons, there was the biggest rebellion of this parliament by MPs of both main parties. It was on a vote on whether we should continue to participate in the EU’s single market through being part of the European Economic Area (EEA). In spite of this Labour MPs were whipped by our leadership to abstain on this issue, whereas the government whipped their MPs to vote against. Seventy-six Labour MPs (more than half of our backbenchers) defied the whip – myself included – to vote for the UK to stay in the EEA. We were joined by the Conservatives Anna Soubry, Dominic Grieve and Ken Clarke, with another 11 Tory MPs signalling their support for the EEA by abstaining on the issue instead of following the whip’s instructions to vote against. However, 15 Labour MPs actually voted against the UK remaining in the EEA. This is a small minority – less than 6 per cent of our MPs – but their views cannot and should not be dismissed. A few commentators suggested the division on the Labour side fell along geographical lines, with London MPs in favour of staying in the EEA and non-London MPs against. But this is not supported by the numbers. Fifty-three of the 76 Labour MPs voting for the EEA actually represent seats outside of London, and a majority of those 76 represent seats in Leave-voting regions. A number of objections are raised against the EEA in Commons debates by MPs in both main parties. Some say that if we stay in the EEA, we will somehow have blocked “the will of the people” – even though nothing like that was put on the Brexit referendum ballot paper. It seems that some commentators are determined to tell us all Brexit voters specifically wanted to come out of the single market and the customs union. In reality, we have absolutely no idea where they stand on these issues apart from the fact that they did think leaving the institution of the EU was a good idea – and that could have been for a number of very different reasons. Yet none of the objections I’ve heard have gone to the heart of where most concern lies about the EEA: immigration and the continuation of some form of free movement, a requirement of participating in the EEA. I am the son of an immigrant and represent a constituency where the majority of families are of immigrant stock. But many of the communities Labour represents are the opposite, which is why more than half the seats we hold voted to leave the EU. That doesn’t mean that people are xenophobic or racist, but there is concern about the levels of immigration to certain places and, as I’ve said before, we cannot duck or ignore it. Honesty is required: views are just as strong, if not stronger, in relation to non-EU immigration as they are in relation to EU immigration. There are parallels between the discontent in some traditional Labour-voting areas about EU immigration and the same discontent regarding Commonwealth countries in the 1960s. There was, after all, a form of free movement from the Commonwealth until 1971 – my own father took advantage of that. I have never denied that immigration can pose both economic and cultural challenges to communities, but it need not be this way if we deal with it in the right way. A reform package of policies to better manage migration from the EU could include things like action to prevent the undercutting of wages by immigrants, removing newcomers after nine months if they fail to find a job, and putting in place a bigger infrastructure fund to help mitigate the impact of migration on local communities. I would add that we need to do far more to help integrate immigrants into local communities, as the All Party Parliamentary Group on Social Integration, which I chair, argues in our report Integration not demonisation. My father was so successful in this regard that he married an English woman and had mixed heritage children. We can do all of these things now while we are still in the EEA because of our EU membership. But what are the real underlying causes of concern about immigration? Not enough decent, affordable housing. A shortage of school places. An NHS in crisis. Not enough well-paid and decent jobs. These problems will not disappear or be mitigated if we leave the EEA. They will get worse because there will be less revenue going to the Exchequer to pay for these things. The underlying problems we have are no more the fault of European immigrants now than they were the fault of Commonwealth citizens back in the 1960s. And make no mistake: people were saying exactly the same things in traditional Labour-voting areas about the Windrush generation, South Asian immigration and the likes of my father being the cause of those problems way back then. Ending Commonwealth free movement then and ending EU free movement now did not and will not solve these problems, and deep down we know it. That is why Labour governments, including that of Callaghan when he became prime minister, have always principally addressed these problems by properly funding the NHS, by building more affordable homes, investing in our schools, introducing a minimum wage and so on. By acquiescing in the fiction that immigrants are ultimately the problem and that these underlying issues will be resolved if EU free movement ends, all we do is put British jobs at risk – which would be rather odd for a party that claims to represent the interests of “labour”. The British government has published its long-awaited White Paper on its future relationship with the EU. The plan envisages a free trade area between the UK and EU based on a "common rule book" for the production and sale of goods, as well as for agriculture and fisheries products. The UK would develop its own services regime, but would seek reciprocal access to the EU financial markets. Prime Minister Theresa May has said the proposal "is delivering on the vote of the British people", following comments by US President Donald Trump claiming he was unsure whether the different route Mrs May is taking fulfilled the wishes of the people. The paper proposes a customs partnership that London claims will allow the UK to maintain frictionless trade with the EU, and to avoid a hard border on the island of Ireland. The White Paper states that the future trade arrangements will mean that the so-called backstop - or insurance policy to avoid a hard border - will never need to come into effect. The paper says that disputes over how the common rule book should be interpreted would be handled by a Joint Committee and arbitration between both sides. Britain's proposal for a Brexit deal received a guarded welcome in Brussels, with the European Parliament's delegation saying the wide-ranging draft went in the direction it wanted. The EU's chief Brexit negotiator Michel Barnier said in a tweet that the paper will be analysed and looks "forward to negotiations with the #UK next week." The paper, titled 'The Future Relationship between the United Kingdom and the European Union', envisages a close future relationship on a range of areas, from the economic sphere, to security, data, science and innovation. The actual degree to which the UK will be subject to ongoing EU rules and regulations remains the subject of bitter debate within the Conservative Party. The 98-page document envisages the UK remaining in a number of EU agencies, such as those which government aviation, chemicals and medicines. However, the EU may frown on third countries being full members of such agencies, especially as they are operated under the jurisdiction of the European Court of Justice. The UK will also seek to remain close to the EU's energy and transport markets. In particular, membership of, or some kind of alignment with, the EU's energy market is seen as vital for the continued operation of the Single Electricity Market which operates on the island of Ireland. The White Paper acknowleges this. London also seeks to develop a common rule book for state aid and competition law, one of the most tightly regulated aspects of EU membership. In order to ensure that the UK will not seek to undercut the EU economy after Brexit, the paper proposes "non-regression" clauses that would govern the environment, employment and social rights. The common rule book would be legislated for in the UK by parliament and the devolved administrations of Scotland, Wales and Northern Ireland. On the continuing negotiations between the EU and UK on the Northern Ireland backstop, British sources insist that the White Paper effectively removes the need for the backstop to be ever needed. Sources say that the Temporary Customs Arrangement (TCA), which was published on 7 June, remains the UK's preferred alternative to the European Commission's version of the backstop, which was enshrined in the draft Withdrawal Agreement as a protocol. The TCA envisages the backstop being applied UK wide, so as to avoid any checks on the Irish Sea, as well as avoiding a hard land border. London also wants the backstop to be time-limited, coming to an end at the end of 2020. Both the Irish Government and the European Commission Task Force have dismissed any notion that the backstop would be time-limited, with the EU's chief negotiator insisting that the backstop should be applied to Northern Ireland only. The Government and EU member states have also rejected the TCA since it did not address the issue of regulatory alignment and the need to avoid checks on whether or not goods and agri-food products comply with a huge range of EU rules. British officials, however, say that the question of regulatory alignment is dealt with in the White Paper by way of the free trade area, combined with a common rulebook on standards. Officials acknowledge, however, that the backstop remains the subject of a parallel negotiation between the UK and EU. Tánaiste and Minister for Foreign Affairs Simon Coveney has said the British Government's position on Brexit has become much more credible following the publication of its White Paper today. EU leaders are considering a compromise over Brexit that would allow Britain access to the single market for goods while ending freedom of movement of people. In the first sign of divergence between EU member states and Brussels’ chief negotiator Michel Barnier, leaders are expected to sound out Theresa May about a compromise at a summit in Salzburg next month. However, the deal would come at a price, as it would involve Britain accepting all future EU environmental and social protections - which Eurosceptics say is “not Brexit”. Downing Street is understood to be cautiously optimistic that leaders of the EU27 countries are finally engaging with Mrs May’s Chequers plan for Brexit after Mr Barnier had previously dismissed it as unworkable. The European Commission declined to comment on the plan, but did not deny that member states “may be discussing it”. Until now, Mr Barnier has insisted that Britain cannot “cherry pick” parts of EU membership, such as access to the single market, while rejecting others, such as freedom of movement. However, member states are considering allowing Britain to remain in the single market for goods if it is prepared to tie itself to EU standards on environmental and social protections in perpetuity. The Chequers plan involves signing up to a “common rulebook” with the EU but allows for Britain to diverge from Brussels in future if Parliament decides to. Tory Brexiteers say Mrs May has already conceded too much ground with her Chequers plan, and warned that promising to accept future EU rule changes would turn Britain into a “vassal state”. David Jones MP, the former Brexit minister, said: “What this shows is that if we talk tough, as we have been doing over no deal, the EU will move towards us. Christopher Booker writes for the Sunday Telegraph and is the bestselling author of The Seven Basic Plots, The Real Global Warming Disaster, The Great Deception and Scared to Death. He was the founding editor of the satirical magazine Private Eye. Richard North was formerly a research director in the European Parliament, he is also a political analyst through his EU Referendum blog and an author. I voted Brexit- just to make that clear. More damningly, in line after line, the faceless Whitehall mandarins behind the astonishing briefing paper FCO 30/1048 actively welcome Britain’s decline and Europe’s predominance. The briefing paper acknowledges that Britain would in time become little more than a puppet state of Brussels, after ceding judicial and executive powers to the fledgling EU – then called the EEC. But, instead of sounding alarm bells, the authors of the paper warn ministers to hide the truth from the British public. And, damningly for Tory Prime Minister Edward Heath, and all those who kept quiet about the findings in the early 70s, the document, known as FCO30/1048, was locked away under Official Secrets Act rules for almost five decades. What the writers – famously championed by Mr Heath – could not have envisioned was that the British public would see though the audacious abuse of power and vote to LEAVE Europe in a fiercely contested referendum half a century later. To some critics the lie is at the heart of the Brexit battle faced by Theresa May as she prepares to fae her embattled delegates at Tory Party Conference, in Birmingham next week. The classified paper, dated April 1971, even suggested the Government should keep the British public in the dark about what EEC membership means predicting that it would take 30 years for voters to realise what was happening by which time it would be too late to leave. Bizarrely FCO 30/1048 reads more like an educated anarchists’ guide to crushing Britain’s political standing on the world stage than the sober briefing of civil service pillars of the British establishment. The language suggests repeatedly that the British people are too stupid to grasp the implications of joining the EEC (which became the EU in 1993) and that indeed this stupidity could be used against them to hide the truth until it was essentially too late to do anything about it. Again and again they assert that Britain’s parliament will be sidelined and that, sooner rather than later, there will be a United States of Europe with a single currency. The paper starts with a academic discussion of sovereignty – arguing that sovereignty is not necessarily a good thing. The first acknowledgement that Britain was about to transfer significant powers to Europe. “we shall be accepting that the Commission will jointly represent the member states, who to that extent will have their individual international negotiating powers limited; and we shall in various fields be accepting a wide degree of coordination of our policy with that of the rest of the Community. All of this we shall be accepting “for an unlimited period,” with no provision for withdrawal. Paragraph 12(I) is one of the most damning – as it clearly details the way in which EU law will trample over British law. But that this must be kept from the common knowledge of the British people. He writes: “By accepting the Community Treaties we shall have to adapt the whole range of subsidiary law which has been made by the Communities. Not only this but we shall be making provision in advance for the unquestioned direct application (i.e. without any further participation by Parliament) of Community laws not yet made (even though Ministers would have a part, through membership of the Council, in the making of some of these laws). Community law operates only in the fields covered by the Treaties, viz, customs duties; agriculture; free movement of labour; services and capital; transport; monopolies and restrictive practices; state aid for industry; and the regulation of the coal and steel and nuclear energy industries. Outside this considerable range there would remain unchanged by far the greater part of our domestic law. Clause III adds with shocking prescience that the seismic legal shift would in effect be creating a federal law in a United States of Europe. And this was 46 years ago, back in 1971. He writes: “The power of the European Court to consider the extent to which a UK statute is compatible with Community Law will indirectly involve an innovation for us, as the European Court’s decisions will be binding on our courts which might then have to rule on the validity or applicability of the United Kingdom statute. 15. (i) National Identity: "We are all deeply conscious through tradition, upbringing and education of the distinctive fact of being British. Given our island position and long territorial and national integrity, the traditional relative freedom from comprehensive foreign, especially European, alliances and entanglements, this national consciousness may well be stronger than that of most nations. The following paragraph iv is so damningly anti-British it reads like the ramblings of some pseudo Guy Burgess type Oxbridge communist attacking, as it does, Britain’s idea she has any power on the world stage as fantasy. In a section that could have been written 46 minutes ago rather than 46 years ago he deals with the inevitable – and welcome – single currency, and the prospect of an EU army. Towards the end the anti-British, pro-Europe rhetoric is in full flow, accepting Britain’s notion of itself as an independent state would be completely dismantled. Britain would be a European state, it’s Parliament neutered. "19...then over a wide range of subjects (trade, aid, monetary affairs and most technological questions) Community policies toward the outside world would be common or closely harmonised. Although diplomatic representation would remain country by country its national role would be much diminished since the instructions to representatives would have been coordinated among member states. By the end of the century with effective defence and political harmonisation the erosion of the international role of the member states could be almost complete. This is a far distant prospect; but as members of the Community our major interests may lie in its progressive development since it is only when the Western Europe of which we shall be a part can realise its full potential as a political as well as economic unit that we shall derive full benefits from membership." "20. …of the functions of the Community could probably only take place with concomitant development of the institutions of the Community. It is hard to envisage the necessary decisions being taken under the present organisation of the Community; more effective decision-making at Community level would either require majority voting on an increasing range of issues in the Council or stronger pressures to reach quick decisions by consensus. In either case the role of the Commission would become more important as the Community became responsible for the regulation of wider areas of the internal affairs of the member states and this would in turn increase the need to strengthen the democratic institutions of the Community, including perhaps a directly elected Parliament. In that event the development of a prestigious and effective directly elected Community Parliament would clearly mean the consequential weakening of the British Parliament as well as the erosion of 'parliamentary sovereignty'." This edition of the program is about the Brexit crisis. PM May is likely to receive a no confidence vote due to the concerns of the many including the Labor leader and the Scottish first minister regarding the fate of the agreement. Dr Martin Parsons is an author and has recently completed a book on Conservatism and UK national identity and values. Please note that first section: All peoples have the right of self determination. By virtue of that right they freely determine their political status and freely pursue their economic… development. Requiring the UK to sign a treaty taking away that right to determine our own political and economic development i.e. leave the backstop, without the EU’s permission, is a clear violation of Article 1 of the ICCPR. Now, the EU actually makes great play of the importance of the ICCPR; in fact, it is a major tool of EU foreign policy. Through the EU’s Generalised Scheme of Preference (GSP), it grants a number of developing countries zero tariff or low tariff access to the EU Single Market – providing that they actively comply with a number of international human rights conventions, among which the ICCPR is prominent. Compliance requires not simply saying the right thing, but also doing the right thing. For example, in February this year there was serious concern amongst business leaders in Pakistan that they could lose GSP status precisely because of Pakistan’s non-compliance with aspects of the International Covenant on Civil and Political Rights. It is therefore an extraordinary and shameless act of double hypocrisy for the EU to breach the ICCPR in such a blatant way. There are actually other international human rights conventions which the EU has potentially breached in the draft Withdrawal Agreement as well. For example, Article 73 of the UN Charter which relates to countries which do not have ‘a full measure of self-government’ i.e. where a foreign power exercises a measure of political or economic control, requires that foreign power to recognise ‘the principle that the interests of the inhabitants of these territories are paramount’, while the UN convention relating to such territories specifically states that: Any attempt aimed at the partial or total disruption of the national unity and the territorial integrity of a country is incompatible with the purposes and principles of the Charter of the United Nations. However, returning to the International Covenant on Civil and Political Rights (ICCPR), it is clear that the draft Withdrawal Agreement is a very blatant breach of the ICCPR, which is legally enforceable in any country which has ratified it – as all EU members states have. It is therefore possible for anyone to apply for judicial review of the Withdrawal Agreement. However, even if a request for judicial review were refused – because all 28 EU member states have ratified not just the ICCPR itself, but also the First Optional Protocol, a referral can be made directly to the UN Human Rights Committee by any individuals who claim that any of their rights enumerated in the Covenant have been violated and who have exhausted all available domestic remedies may submit a written communication to the Committee for consideration. As all EU member states are required to collectively agree the Withdrawal Agreement, they become liable when they do so. I wonder how the people of Belgium or Germany – or for that matter Ireland – will feel about being investigated by the UN Human Rights Committee because of a serious breach of an international human rights convention by the European Union as it sought to retain control over an independent sovereign nation after it left the EU? Sputnik spoke to David Coburn of UKIP for his take on Theresa May's Brexit deal which she presented to the Houses of Parliament today, after a dramatic day at Westminister when we saw the resignations of one minister after another. Sputnik: What do you make of the deal that Theresa May presented to the House of Commons this morning? David Coburn: It's the worst deal that the world has ever known — the worst deal in the world, utterly ridiculous. It's worse than being in the European Union, it has none of the advantages and all of the downside. No-one in their right mind would sign up to this. She's betrayed the country and she's betrayed her party I believe. And she's misled her cabinet who are resigning in droves and I don't blame them frankly — it's appalling. Sputnik: What chances do you think there are of the Houses of Parliament voting for this deal? David Coburn: I think you're seeing the demise of the Conservative Party — it's falling apart at the seams. For years there's been a fratricidal pact over the European Union and finally, the knives have come out — this is it. I was surprised that David Mundell — who made a big play of being a Unionist (personally I don't think they are Unionists the conservatives in Scotland) — he's letting down the country by not resigning. He should resign. He's betraying our fishermen and it's an absolute scandal. READ MORE: 'Rotten Deal': What's in Brexit Agreement That is Enraging UK Politicians? Sputnik: Should Theresa May resign? David Coburn: Resign?! She should have never been elected in the first place. Absolutely she should resign. It's a disgrace — what's she done to the country is appalling. She's led us along for these two years when we should have been preparing for the country leaving without a deal. She's done not a lot to deal with that. I think she's been leading people along because quite frankly this deal is worse than being the European Union — it's appalling. The European Union are not our friends — they are our enemies, they want to destroy us, they want to break up Great Britain. We didn't make a great deal of fuss about the problems they're having in Spain with the Catalunians — we could easily have done that — but the EU is not allowed to interfere in the internal affairs of sovereign nations. And that's why they haven't interfered in Spain but they seem very happy to intervene in Northern Ireland. Then the Irish Republic are not our friends, we have given them enormous amounts of money when they went bust. Quite frankly they would pull the rug from under our feet — they're just out to get us as well. It's a disgrace. And for the PM to allow the country to be embarrassed like this — she's not fit for office. Sputnik: Would you say a No deal is the best deal? David Coburn: I've always said No deal — we walk out without a deal and what you'll find is they all come begging at our door. Because we buy more from them than the other way around so quite frankly they need us. You'll be having German industry battering at the German Chancellor's door begging for something to be done, then you've got the French. The French have enormous problems have enormous problems having to sell their goods — they have to compete with Australia, New Zealand, all over the world. We don't have to drink French wine, it's not in their interest for Britain not to be drinking it. We're one of the biggest consumers of champagne. And their cars — the Germans want to sell their cars but of course Japanese will be infinitely cheaper if we are out of the European Union. We need to leave without a deal and we'll make deals with countries all around the world. What does BREXIT really stand for? When you look up the meaning of 'BREXIT' you get this, "a blend of the words 'British' or 'Britain' and 'exit". People now realise, thanks to Mrs May and her Government, with a little help from the European Union, it really means a disastrous and chaotic state of affairs. After two years of negotiations, 585 pages of a document and three hours in the House of Commons answering MP's questions, no one is really satisfied and we the public, are hardly any the wiser. In fact there is surely an opportunity for Cornish confectioners here for a 'Brexit Fudge'? Some may even think that history is repeating itself and this is a re-run of Neville Chamberlain's 'piece of paper', which at least had the benefit of brevity going for it, if not integrity. For make no mistake the economic consequences of a disruption to forty percent of our foreign trade could be as threatening to Britain, as was the attempted military blockade in the the Second World War. It would appear that European memories are short and goodwill for past deeds cannot be relied upon when it comes to negotiations to untangle the Gordian Knot; to break free of the Quantum Entanglement! The twenty-seven insist that if Britain truly wishes to be out, it cannot enjoy the economic advantages of the club and it knows it holds the ace hand, so indebted and interdependent have we become. Whatever the pros or cons of the putative deal Mrs May has negotiated, and to which she has indelibly attached her own reputation, it appears to satisfy no one - not her own party, the opposition, the composite nations or the people - but no one can be surprised. Mrs May and the Conservatives particularly find themselves between a rock and a hard place but the other parties equally so. From the beginning this was a divisive issue with a divisive referendum solution. How could it be otherwise? That is what a bipolar 'yes' or 'no' answer does. What is clear is that responsibility for it rests with the Conservative Government. The fact that David Cameron never revisited the Arctic, whilst deciding to create a new and irrelevant railway, should have been warning signs of superficiality and rash decision making. It is one thing to deliver a referendum, quite another to deal with the enormous consequences. Did he do the honourable thing and fall on his sword like Brutus, or was it more akin to Napoleon after Waterloo, running away from the sound of battle? Either or neither, he clearly left it to others to clear up the mess and with the aid of the dark arts and unprincipled behaviour, Mrs May was passed the poisoned chalice that she appeared to accept with alacrity. So we ended up with a pro-EU PM leading the retreat, who subsequently reneged on every one of her own 'red lines' - hardly a recipe for success. Some might even suggest darkly that it was designed to fail, and Mrs May who proved herself a safe pair of hands for the deep state at the Home Office - if such a thing exists - was chosen for that very purpose. The suggestion that those in real control in both Britain and Europe never intended a real separation and that a hidden agenda has steered events, is hinted at from a number of directions. Once the decision to leave was stated publicly, Her Majesty's Principal Secretary of State for Exiting the European Union or informally, 'Brexit Secretary', was appointed in the person of the smiling, jocular David Davis, hardly setting an appropriate tone for such serious negotiations. This did not bode well, indeed may have been intended to suggest such. Of course he didn't last long and was replaced by the aspiring Dominic Raab who lasted an even briefer period, not able 'in good conscience' to promote the agreed terms. Now a veritable unknown, Stephen Barclay MP, fills the role but for how long and at what cost to his political career? "To lose one Brexit secretary might be regarded as misfortune, to lose two carelessness" in Wilde's famous phrase, but the real reason is that neither could stomach the deceit that the agreed terms entailed. In David Davis' words, the proposed deal "has taken away all the benefits of Brexit" in addition to suggesting that the EU has intentionally prevaricated to make a clean break impossible. One of the fundamental problems for the Brexit Secretary was that control of the negotiations was actually controlled somewhere else, namely in the Cabinet Office, and this is where the suggestion that the process was deeply influenced by the Security Services and perhaps a NATO orientated agenda that precludes separation, gains credence. On the 24th October 2018, the crucial position of Cabinet Secretary and Head of the Civil Service, was filled by Sir Mark Sedwill when Baron Heywood of Whitehall (Jeremy Heywood) retired on health grounds. He died from lung cancer diagnosed in June 2017, on the 4th November, 2018. aged 56. Heywood was closely associated with Tony Blair in a number of contentious issues around the Iraq policy, failure to keep notes on the death of David Kelly, refusal to release notes of conversations between Blair and Bush and other matters of importance. His replacement, Mark Sedwill has been deeply embedded in NATO-related security roles throughout his career. He was Mrs May's Permanent Secretary at the Home Office 2013 to 2017 when Mrs May was Home Secretary. Sedwill joined the Foreign and Commonwealth Office in 1989, and immediately operated in the Security Coordination Department and Gulf War Emergency Unit. His career was then closely connected to Iraq and Afghanistan war zones and from 2003 to 2005 was Deputy High Commissioner to Pakistan. From 2009 to 2010, Ambassador to Afghanistan. It is well known that such positions are frequently those of MI6 Officers. From 2017 he has been the National Security Adviser. So I believe perhaps for the first time, the roles of Cabinet Secretary, Head of the Civil Service and National Security Adviser have been combined in one person who in effect is, or has been, in effective control of the Brexit negotiations. In this context it is not hard to discern the the hidden but powerful hand of MI5/MI6. One further important suggestion that separation from the European 'Leviathan' (in Thomas Hobbes' visualisation) is the entrenched military position both through NATO and by other agreements never properly discussed or examined by Parliament. The scene was set in 2010 with the Lancaster House Agreement between British Prime Minister David Cameron - yes the same bloke that got us into the Brexit mess - and French President Nicholas Sarkozy for closer military ties with France for defence and security co-operation. This continues largely under the radar so to speak. In January 2018 Mrs May announced a joint French/British 'expeditionary force' of 20,000 men to quickly and effectively face any threat by 2020. This must mean it is already in formation. This runs alongside the largely unreported naval cooperation between the two. Also by 2020 an 'integrated carrier strike group', allowing British and French aircraft carrier interdependence and control. Note how all this comes together around 2020 - a perfect vision for the future, although largely out of sight of the electorate that might otherwise not approve of this fundamental loss of sovereignty? Britain's nuclear defence capability has always been subject to American veto, but now it would appear a fundamental realignment is taking place with Britain and France pooling their development and control systems, and this against the background music of Trump withdrawing from NATO and Macron suggesting Europe may need to defend itself against America as much as from Russia. Where is all this going? Certainly Britain and France showed it was able to bomb a joint policy in Libya and Syria - with largely disastrous results, not to mention the claimed 'ISIS' inspired terrorist attacks rather conveniently and suspiciously targeted principally on France and Britain at points of political significance. Mr Macron said France's defence and security co-operation with the UK had not been "challenged or revisited or impacted" by the vote for Brexit. Perhaps they both knew something the British public didn't: that leaving the EU was never really a viable option and would not be permitted? If nothing else the debacle proves that Britain developed a system of representative government and eschewed referendums for a reason. How can the public decide a fiendishly difficult issue with a simple yes/no vote, particularly if it is not afforded adequate information of the consequences? Leaving aside the truism that 'minorities are always right', simple majorities are just that, simple, and leave behind them inevitable division. That is why most votes on constitutional issues require a larger majority to carry. If as some, including leading figures in the Labour Party, are advocating a second referendum, this would obviously please the 'remainers' and the EU as the chaos and adverse consequences now apparent, would probably shift the balance back to 'remain'. However it would solve little and may even create greater unrest from those who felt cheated. Nor would it solve the fundamental issues with membership. In trying to placate both sides of the argument, Mrs May has satisfied neither. She still has to get the plan through Parliament but it is clear she can only do so with the support of the opposition which seems on the present terms to be unlikely. We should also have to go back to Pitt the Younger to find a parallel. Unless it is intended to impose an unelected dictatorship, parliamentary protocol requires resignation if the Prime Minister loses the confidence of the House. She says she is determined to stay on - under what conditions? Perhaps it is only the undesirability of the Leader of the Opposition and his team that is keeping her there? If nothing else, we certainly live in interesting times. British Prime Minister Theresa May has repeatedly urged that the "national interest" is at stake over her Brexit plan. She is calling for businesses and politicians to rally around safeguarding ordinary people's jobs and livelihoods - and to back her draft divorce deal with the European Union. A parliamentary vote is due in the coming weeks. However, the timing of a shocking report on British poverty by the United Nations makes May's appeals rather hollow, and it sounds an alarm about the dire direction the country is headed. Professor Philip Alston, the UN Special Rapporteur, spent two weeks visiting diverse communities across Britain, and his report on growing poverty makes a damning case against the economic policies of present and past Conservative governments. One-fifth of the British population — or 14 million people — are living in poverty, according to the UN report. The miserable social conditions for communities has become particularly worse since 2010 under two successive Conservative governments. What's more, the report concludes that poverty in Britain is likely to become even more acute and widespread following the country's departure from the European Union. While the deadline for divorce is at the end of March next year — only four months away — Britain is facing years of economic uncertainty in its transition out of the bloc, during which period the impact will be hardest on low-income people, according to the UN study. Another factor is that Britain will no longer receive social development funds from the EU which had helped mitigate deprivation in many marginalized communities. Those who advocate for Brexit often complain that British taxpayers' money is funneled to Brussels as part of its membership of the bloc. They claim that after Britain quits the EU, then these funds will be available for spending on British public services. Such logic is questionable in light of the UN poverty report. Prof Alston's investigation found that social deprivation in Britain has been compounded by "mean-spirited" and "callous" government policies which have prioritized economic austerity cutbacks over public welfare. So, if successive British governments have not shown much care towards poor people over the past eight years, out of a dubious ideological conviction, then why would they suddenly adopt a caring attitude in a post-Brexit period? Much more realistic is the expectation that as Britain undergoes wrenching changes to its economy over Brexit, the callous attitude of the political establishment will ensure that the disadvantaged become even more disadvantaged in order to pay for the costs of transition. Admittedly, if a Labour government were to come to power in the next few years, then social policies could be more humane and progressive to improve the conditions for ordinary workers and their families, the unemployed, pensioners and those requiring long-term health care. But that's speculative. It might not happen. What we can say for now is that the present government under Theresa May is making an insulting appeal that her Brexit plan is in the national interest. Whatever about the consequences for the rich elite, May's Brexit plan is certainly not in the interest of low-income Britons and the burgeoning ranks of the poor. A masked demonstrator stands in Parliament Square during the Million Mask protest march in London on Thursday Nov. 5, 2015. It is true that many working-class Britons voted for Brexit in the June 2016 referendum. But did they envisage what the consequences would entail? They were also sold a lot of false promises by the likes of Boris Johnson and other British toffs who fantasize about rejuvenating Rule Britannia Empire. The UN report notes that Britain is the fifth richest economy in the world. Yet it has one of the highest rates of poverty among so-called developed nations. That's dysfunctional capitalism for you. Since Conservative governments embarked on an ironclad policy of economic austerity, over the past eight years some £39 billion ($50 billion) has been axed from public welfare and services. Those cuts have directly impacted communities and social conditions turning cities, towns, villages and housing estates into depressed zones of blighted lives for millions of people. The UN report found record numbers of Britons subsisting by going to food banks and other charitable centers in order to get their next meal. That is even the case for people who have jobs, such is the rampant poverty-in-work culture across Britain. Record numbers of people are living rough on the streets. Some have resorted to prostitution just to buy food. Or joined criminal gangs as a way to survive. Charles Dickens would have lots to write about if he were still alive. A damning figure is this: the $50 billion that Conservative governments have cut in public spending over eight years is comparable to what Britain spends every year on its military budget. The only way that Brexit would be in the national interest is if the country somehow acquires a government that is truly democratic and committed to social justice. A government that is courageous and willing to challenge the abysmal gap between rich and poor, to embark on social and economic policies that prioritize the needs of workers and ordinary people, not the rich elite. The record of the British establishment shows that it has negligible concern for the working people of Britain, and is only dedicated to enriching the oligarchy and fueling its war machine for aggression against foreign "enemies" like Russia. Under prevailing British politics, one thing is sure. Brexit means Brokexit — more hardship and poverty for the people of Britain. On Wednesday, the Prime Minister presented to Parliament the outcome of eighteen months negotiation with the European Union. Unsurprisingly, she received a dusty reception in the House of Commons. The proposed withdrawal agreement is frankly a capitulation. The British people voted overwhelmingly in the 2016 Referendum to take back control over borders, laws and money. It does not deliver on these demands. The proposed Withdrawal Agreement means the UK will not really be leaving in March. In reality the UK will remain inside the Customs Union for as long as the EU chooses to keep us there in contrast to the pledge given in the Conservative 2017 Manifesto. The European Court of Justice will continue to have control over our laws and Michel Barnier’s deputy Sabine Weyand has summed it up when she said: “They must align their rules but the EU will retain all the controls.” I understand this was why Dominic Raab and resigned as Brexit Secretary. Quite simply this is beyond the pale. So we are trapped in the backstop and trapped in connection to EU institutions. The agreement keeps us effectively ruled over by the European Court of Justice. This isn’t simply my opinion but that of Carl Baudenbacher, a former president of the EFTA court, which oversees the EEA agreement, who has criticised the UK’s decision to accept such a level of ECJ oversight. We will have to pay £39billion to the EU as a divorce bill with next to nothing in return. When the EU has us locked into the backstop with a commitment to match their rules on the environment, on workplace regulations, on competition law, on state aid and competition law. Who is to say what else they will demand? The Chequers plans volunteered that we should subordinate our own industries to the EU Rulebook and the phrasing in the declaration means that we must expect such demands in this direction to come very shortly. As such, we will deliver none of the referendum demands or manifesto pledges. Unsurprisingly this has produced an angry response from MPs, Conservative party members, and the British public. Rather than acknowledge these concerns and reset negotiations to achieve the Canada style free trade arrangement that almost everybody wants for the UK, the Government has embarked on a course - in collusion with the EU - to hoodwink the British people. Everything the EU wants is written in the Withdrawal Agreement which is legally enforceable and has the force of an international treaty. Now a few crumbs are being given to the UK in the political declaration which is not binding on anyone. This is fooling nobody. Everybody knows the political declaration has no legal status concerning international treaty obligations. It is merely a political declaration which is likely to be changed. Effectively it has cost £39billion of UK taxpayers money and the UK Government has failed to demand incremental payments in return for progress on trade talks. Why have we not made the £39billion conditional on achieving such a deal? Instead we have thrown away the opportunities for our future UK economy, preventing ourselves from lowering trade barriers to help poorer countries and restricting ourselves from establishing new trade deals with the USA and emerging markets across the world. How will we deliver exports, trade-led economic growth, jobs, prosperity and smarter regulation which our country needs as an engine for growth? The declaration does not match the promises of a comprehensive and ambitious future framework promised by the Prime Minister in numerous speeches. We could have and should have included a draft trade treaty and legal wording in the political declaration. So this means that the EU has secured almost all of its strategic objectives in the legally enforceable Withdrawal Agreement whereas the UK’s key objectives are only contained in the legally unenforceable Political Declaration. Worse, the declaration commits the UK to establish a new fisheries agreement on access to waters and quota shares. In plain English we have to fetter our control of our own fishing waters or extinguish all hope of a trade deal. This is why I criticised the sequencing of negotiation from the beginning after the invocation of Article 50. We’ve been outmanoeuvred by the EU in a way which was too predictable from the very beginning. The British people are tired of subservience to the EU and tired of this one-sided negotiation process. They are looking for us to deliver an imaginative and ambitious future for our country free of the unnecessary constraints of EU control. If this declaration is allowed to stand and the Withdrawal Agreement is passed we will not be easily forgiven and we will inevitably be sleepwalking to electoral defeat at the next General Election. Presented at Keele University by Morality Man. I put the video here on Youtube after various complaints that people can't watch the video on the original website. The plan by remain traitors is simple I'm amazed the British public are so stupid they cannot see what our traitorous MPs are up to. 4 arrange a really bad deal then pretend it's the best you could get. 5 stir up moronic anti democratic remain camp who are too stupid to ask who is putting all this time and effort into tricking us out of a democratic vote. Sign up to B.S. bad deal wait a couple of years then tell us how bad Brexit has been and we should have another referendum between the bad deal or wto or return . The 3 way vote splits people who where stupid enough to think we still lived in a democracy letting remain/ return win. Theresa May is only the fall guy once she has gone the moronic public with a memory of 2 months at best will forget all about it and go back to thinking a vote actually means something. The Government is a bankrupt Crown Agent. Like all civilised commerce, when a corporation is bankrupt you settle the accounts with what is there and fold the company. All contracts are null and void. Former Bank of England governor Mervyn King has likened Theresa May's Brexit deal to the appeasement of the Nazis in the 1930s. The Brexit supporter wrote a Bloomberg article calling for the deal to be abandoned. Earlier, Bank of England governor Mark Carney warned food prices could rise between 5% and 10% if there was a disorderly Brexit. Theresa May faces deep opposition in Parliament to the proposed deal. Lord King wrote there had been three episodes in modern history when the British political class let down the rest of the country. "In the 1930s, with appeasement; in the 1970s, when the British economy was the 'sick man' of Europe and the government saw its role as managing decline; and now, in the turmoil that has followed the Brexit referendum. "In all three cases, the conventional wisdom of the day was wrong." He said it would be "madness" to "align the country indefinitely with laws over which it has no influence" and that a second referendum "is vital to escape from this continuing nightmare". He also said it was "intolerable for the fifth largest economy in the world to continue indefinitely as a fiefdom", which was what, he said the Brexit deal offered. Lord King has previously criticised the government over stockpiling vital supplies in the event of a no-deal Brexit, saying it weakened the UK's negotiating position. Can firms stop stocks running low? But earlier, Mr Carney told MPs that in the most "extreme" case of a disorderly Brexit, food prices would rise by 10%, but in a less severe scenario the increase would be about 6%. The price rises would come partly from a fall in the value of the pound, partly from any tariffs imposed and partly from increased costs at the border as imports are checked. Mr Carney told MPs on the Treasury Committee: "In the most extreme scenario, your shopping bill goes up 10%." In his Bloomberg article, Lord King said government preparations for Brexit based on trade under WTO terms should have started in 2016 immediately after the referendum, "as I said at the time". Mr Carney told MPs the UK's ports were not ready for a no-deal Brexit that would see the country trade under WTO rules. He said: "At this point in time, the ports are not ready for a move to an administered WTO relationship. "To be absolutely clear, our agents, my colleagues, we have gone to these ports and had conversations directly with the ports in question. We have talked to the private logistics companies, so we have gathered direct information on this." Under WTO rules, tariffs - a tax on traded goods - would be applied to UK goods. The average WTO tariff varies from product to product, from 0% on mineral fuels and pharmaceuticals, to about 20-35% on processed food and 45-50% on meat. If the U.K. parliament supports her plan, it will never be forgiven. When Tony Blair and Boris Johnson unite in their condemnation of the “deal” under which Theresa May proposes that the U.K. should leave the EU, you know something has gone badly wrong. The withdrawal agreement is less a carefully crafted diplomatic compromise and more the result of incompetence of a high order. I have friends who are passionate Remainers and others who are passionate Leavers. None of them believe this deal makes any sense. It is time to think again, and the first step is to reject a deal that is the worst of all worlds. There have been three episodes in modern history when the British political class let down the rest of the country: in the 1930s, with appeasement; in the 1970s, when the British economy was the “sick man” of Europe and the government saw its role as managing decline; and now, in the turmoil that has followed the Brexit referendum. In all three cases, the conventional wisdom of the day was wrong. In the first two instances, it took a revolution: in 1940, the dismissal of the prime minister and his replacement by someone better suited to the role of wartime leader; in the 1970s, a political and intellectual upheaval, and a radical new government capable of changing course. Both times, the country escaped ruin by the skin of its teeth. Today’s challenge is of a similar order. Britain is not facing an economic crisis. It is confronting a deep political crisis. Parliament has brought this on the country. It voted overwhelmingly to hold a referendum. The public were told they would decide. And the rules of the game were clear: Fifty percent of the vote plus one would settle the matter. The prime minister and the chancellor of the exchequer at the time said unequivocally that Brexit meant leaving Europe’s single market and customs union. This was the Brexit that, after the referendum, both main political parties promised to deliver. But a majority of members of Parliament were against leaving, and both parties were split down the middle. For members of the Labour opposition, the opportunity to undermine the government outweighed their views on the issue at hand, momentous though it was. A divided governing party was unable to rely on a majority to support any plan to deliver Brexit. To be sure, no coherent plan has ever been presented. There are arguments for remaining in the EU and arguments for leaving. But there is no case whatever for giving up the benefits of remaining without obtaining the benefits of leaving. Yet that is exactly what the government is now proposing. It simply beggars belief that a government could be hell-bent on a deal that hands over £39 billion, while giving the EU both the right to impose laws on the U.K. indefinitely and a veto on ending this state of fiefdom. Preparations for Brexit based on trade under WTO terms should have started in 2016, immediately after the referendum, as I said at the time. Britain needed a fall-back position — it is foolish to negotiate without one — and that was the form it should have taken. An immigration policy for the post-Brexit world could and should have been published in 2016. But there was no such planning. Instead, the government pretended that everything could be postponed until an imaginary long-term deal could be negotiated. This was naïve at best, and in the event has proven disastrous. And so Project Fear turned into Project Impossible. It is incompetence on a monumental scale. Before the referendum, official economic projections intended to scare the country into voting Remain didn’t succeed. Based on flimsy and arbitrary assumptions, they were subsequently proved wrong. The same strategy has resurfaced. It saddens me to see the Bank of England unnecessarily drawn into this project. The Bank’s latest worst-case scenario shows the cost of leaving without a deal exceeding 10 percent of GDP. Two factors are responsible for the size of this effect: first, the assertion that productivity will fall because of lower trade; second, the assumption that disruption at borders — queues of lorries and interminable customs checks — will continue year after year. Neither is plausible. On this I concur with Paul Krugman. He’s no friend of Brexit and believes that Britain would be better off inside the EU — but on the claim of lower productivity, he describes the Bank’s estimates as “black box numbers” that are “dubious” and “questionable.” And on the claim of semi-permanent dislocation, he just says, “Really?” I agree: The British civil service may not be perfect, but it surely isn’t as bad as that. The U.K. is a European country, and always will be. Trade and contacts among the nations of Europe can and should continue much as before. And I have no doubt they will do so. But the political nature of the EU has changed since monetary union. The EU failed to recognize that the euro would demand fiscal and political integration if it was to succeed, and that countries outside the euro area would require a different kind of EU membership. It was inevitable, therefore, that, sooner or later, Britain would decide to withdraw from a political project in which it had little interest apart from the shared desire for free trade. Leaving the EU is not the end of the world, any more than it will deliver the promised land. Nonetheless the country is entitled to expect something better than a muddled commitment to perpetual subordination from which the U.K. cannot withdraw without the agreement of the EU. Many MPs will argue that “we are where we are,” that it’s too late to change course, and that May’s deal is the only deal available. But remember, this is a political not an economic crisis. If Blair and Johnson, from opposing political viewpoints, can see the fatal weaknesses of this proposed deal, politicians of all hues should try to do the same. This deal will not end the divisiveness of the debate about Britain’s relationship with the EU. The Remain camp will continue to argue, correctly, that to align the country indefinitely with laws over which it has no influence is madness, and a second referendum is vital to escape from this continuing nightmare. And the Leave camp will argue, also correctly, that it is intolerable for the fifth largest economy in the world to continue indefinitely as a fiefdom. If this deal is not abandoned, I believe that the U.K. will end up abrogating it unilaterally — regardless of the grave damage that would do to Britain’s reputation and standing. Vassal states do not go gently into that good night. They rage. If this parliament bequeaths to its successors the choice between a humiliating submission and the abrogation of a binding international treaty, it will not be forgiven — and will not deserve to be. There are a number of examples of referendums in Europe which have been ignored by the government of the day. The most recent and striking example was in July last year when the Greek people voted by about 61 per cent to 39 per cent to reject harsh austerity policies sought by the EU and other global institutions in exchange for a multi-billion-pound bailout. Despite the vote, the left-wing government in Athens, fearing the country’s banks and economy would collapse, agreed shortly afterwards to even tougher austerity measures. In 2008, Ireland threw the EU into chaos when it became the only country to hold a referendum on the Lisbon Treaty – and voters rejected it by a majority of 53 per cent. In order for the treaty to become law, it had to be ratified by all member states. Amid concern that attempts to streamline and formalise the workings of the EU were being held up by one relatively small member state, Irish and EU politicians urged people to think again. A new referendum was held in 2009 and this time 67 per cent of voters backed the treaty. The Lisbon Treaty was designed as a replacement for the ‘Treaty establishing a Constitution for Europe’ or TCE, which was rejected in referenda in France and the Netherlands in 2005. Some view the Lisbon Treaty as much the same kind of deal as the TCE, making it arguable that the French and Dutch governments ignored their TCE referendums. However, the Lisbon Treaty was changed in an attempt to assuage opposition. For example, it removed references to EU symbols such as the flag, anthem, motto, currency and ‘Europe Day’ that had given rise to fears that a ‘superstate’ was being created. It was notable that, this time, no other country apart from Ireland held a referendum on ratification. Ireland also voted against the earlier Nice Treaty in a referendum in 2001 but supported it in a second vote the following year, after a number of reassurances including that it would not have to join a common defence policy. The Brexit referendum had no force in law and was purely advisory, but the political consequences of ignoring it might be considerable. Which celebrities support Brexit and which support Remain? Top lawyers have said MPs must still vote to pass an act to repeal the legislation that took the UK into the EU in 1972 if Brexit is to happen. This act is unlikely to be introduced until after the Conservative party chooses a new leader, as David Cameron has said he will not trigger Article 50 of the Lisbon Treaty, which would start the process under which Brexit would take place. Pro-EU MPs will then face a decision, possibly in November, as to whether to vote against their consciences for Brexit to respect the referendum vote, or do what they think is best for the UK. This dilemma could be complicated if the UK economy is becoming weaker and polls appear to show most people are now against Brexit. An opinion poll carried out in the wake of referendum suggests 1.1 million people who voted Leave now regret doing so.